How To Get On The First Page Of Google Without Trying! 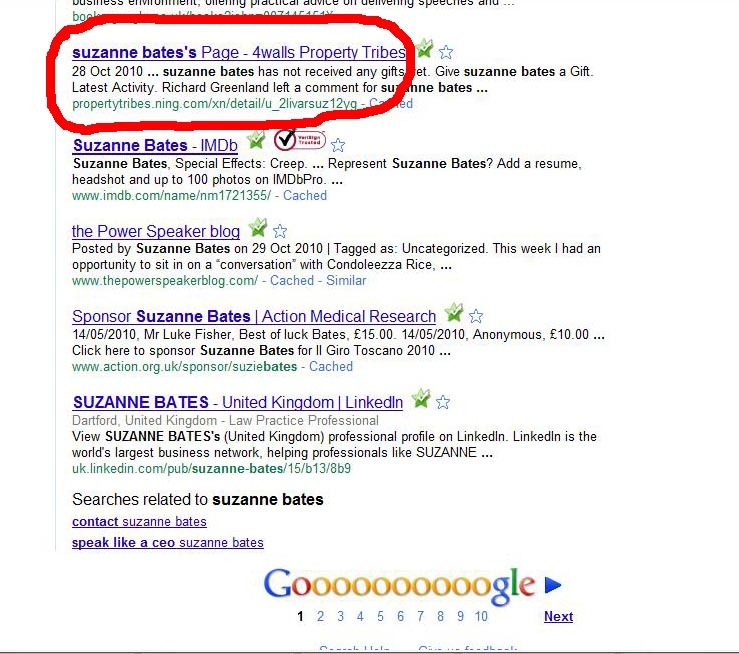 A colleague of mine emailed to ask me if I’d seen a thread relating to my blog that had been posted onto the ‘Property Tribes’ forum (a place where like-minded investors share their experiences) It was posted in good faith by Vanessa, who runs the site along with Nick Tadd. I was at first disappointed at some of the negative remarks but on the plus side, all the interest actually increased my blog viewings by over 100% and the thread ended up on page one of Google! Google page one without trying! Bad news sells Newspapers. People always want to know if you’ve been up to no good, it’s human nature. Look at all the celebrities who get bad press, whether allegations are true or not, people still feel the need to know all the gory details, and the worse the news, the more publicity it gets. If one of them passes a driving test you may never hear about it, but if they’re found to be having an illicit affair then you can be sure it will be all over the papers the next day before they’ve even bothered to get the full facts. So anyway, initially I was a bit disappointed but after giving it some thought, I can totally understand that in this day and age with so many people being scammed in one way or other on the internet, people are often very likely to interpret the unknown as being somewhat suspicious. I get scam emails all the time, and am flooded with people trying to sell me the next ‘amazing product’ they’ve come across. It’s very annoying and I certainly don’t want to be perceived as one of those people. As previously stated, the blog is simply my way of staying accountable and hopefully a guide for new investors, whereby I can share my experiences, mistakes and hopefully successes. I am a down-to-earth, easy going, a little niave at times (don’t think I’ve spelt that right!) but I genuinely just want to be successful in the property field and help others to do the same and hopefully have some fun trying! The ‘about me’ information although rather dysfunctional in places is the truth, and apart from the bit about losing my lovely Mum I wouldn’t change any of it as it’s what has made me the strong person I am today. We all have ‘a past’ which ‘shapes’ us as people and builds our personalities but it’s the way we deal with what we’ve been through whether positively or negatively that determines how our lives will ultimately unfold. I actually have quite a bad temper which has got me into a lot of trouble in the past (because I didn’t know when to keep my mouth shut!) but it’s got better as I’ve ‘matured’ so instead of flying off the handle I now try to I find a way to turn it around to my advantage – and a good sense of humour definitely helps! Anyway, I’ve made some new friends on ‘Property Tribes’ and I met up with Rob Hubbard yesterday (one of the members who’d commented on the thread) who’s a really nice guy and he was very helpful. We had a chat, talked about our property experiences and said we’d keep in touch, which is what these forums are all about, making contacts and friends, sharing our information and knowledge to help each other succeed. If you’ve received this as an email please click on the picture to see the video! A bit late on catching up with this post, thanks for the mention. As promised, we’ve kept in touch.